Beautiful 12th century Tuscan castle located in the heart of Tuscany’s Chianti region. Castello Del Nero is a fully renovated 12th century Tuscan castle located in the heart of Tuscany’s Chianti region, offering a unique experience that goes well beyond that of a typical luxury, five star hotel. Beyond compare to any other that I have stayed in. The property went through a 2 ½ year renovation, completed in 2006, that provides the experience of staying in a traditional Tuscan Estate with all of the modern comforts and technology you would find at a new, luxury hotel. Every detail was thoroughly considered in the restoration, from the rooms to the grounds, to the extent that all of the electrical and phone lines were buried under the ground so as not to obstruct your view of the beautiful Tuscan countryside. One of the key features of the estate is the huge terrace on the back end of the property where you can sit, have a drink (or two) and look out at the countryside for hours on end. Located in the heart of the Chianti wine region, right in between Florence and Siena, Castello Del Nero has over 700 acres of rolling hills covered with vineyards and olive trees. It is actually perfectly situated for a Tuscan vacation as it is about a 45 minute drive north to Florence, 45 minute drive south to Sienna, and only 25 minutes from San Gimignano. There are a total of 50 rooms – 32 guest rooms and 18 suites, each of which has a totally unique footprint and design. We stayed in room 111, which was one of the Double Superior rooms. The room was both elegant and rustic with Stone walls, Terrazzo floors, and High Ceilings with exposed wood beams. The bathroom was huge with a similar feel, as it also had the high, wood-beamed ceiling with terra cotta floors, rain shower and views of the countryside. The hotel has restaurant called La Torre, where we had a fantastic dinner and breakfast. La Torre specializes in Tuscan cuisine and serves wine and olive oil produced locally on the Castello del Nero property. I normally don't like to have dinner in the hotel I am staying at, just to get out an explore the local area, but this is a definite exception to that rule. Or, if you want something more intimate, you can also head to the wine cellar, where the hotel can arrange for a private dinner and wine tasting. 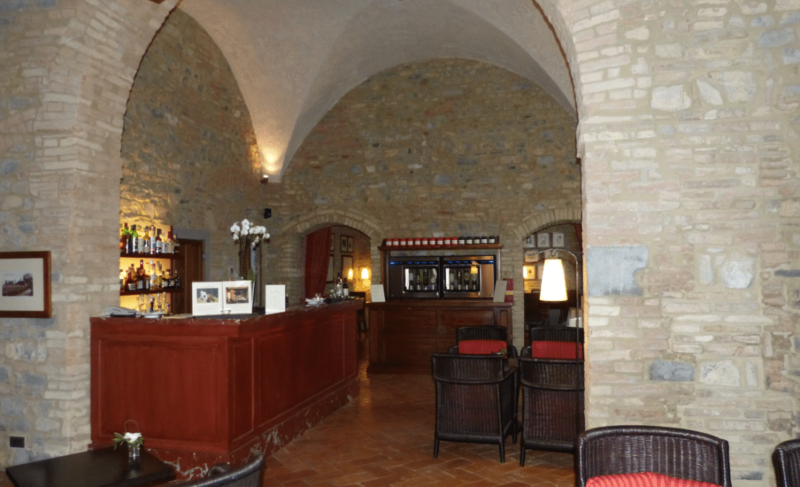 Before you have dinner, make sure you head to The Bar for snacks and cocktails, which, prior to the hotel renovation, was actually the site of Castello Del Nero's kitchen. While the drinks and wine were very good, it was the bar snacks that won me over…. not the typical pretzels or peanuts you find in the U.S. Upon ordering our drink, we were given a platter of prosciutto wrapped bread sticks, salami, cheese and olives. This is standard practice, when you order a drink at The Bar. If the weather is accommodating, there is also a nice Pool with bar built into the vineyard and olive grove. The spa is a big attraction here as well . It was built and is run by ESPA, a leader in luxury spa destinations. There is a vitality pool, 10 massage rooms, and a gym. And yes, even the Gym has a beautiful view of the Tuscan countryside. If you want to get out and see some sites, the hotel provides a free shuttle service to both Siena and Florence. My wife and I stayed at Castello del Nero in late September, which is their busy season, so rates are a little higher this time of year. We ended up using American Express Membership Rewards points for the stay. There is an early booking option, where you pay a non-refundable rate, 30 days in advance, which will generally save you about 20% of typical rates and includes a full breakfast for two. For an executive deluxe room, the prepaid rate was $570.00 per night – this equated to 75,500 Membership Rewards points. Some people would argue that this is not the best “value” for your membership rewards points, but for me it was 100% worth it, and a prime example of why I love collecting points and miles! As far as elite status goes, Castello del Nero is part of the Leading Hotels of the World Program, which does have a loyalty program called Leaders Club. It is, however, different from most hotel loyalty programs because you have to pay to be a member. There are two tiers – the access membership which costs $150 annually and the unlimited membership which cost $1,200 annually. This program only makes sense if you are a frequent guest at LHW hotels, but it does have offer some unique benefits. The access membership would get you a room upgrade (if available), free breakfast and the ability to earn a free night after 5 stays. Another Membership Rewards benefit with LHW is that you can use your Membership Rewards Points to buy a Leaders Club Access Membership for 10,000 points. This is actually a pretty good deal if you are going to be staying at a LHW hotel for more than 1-2 nights with your spouse, as breakfast for two can easily by $60+ per day at these hotels. At a range of 70,000+ membership rewards points per night, there are a couple of ways you can stay at this hotel for free. The first is via being a leaders club member and earning points through stays. This method will take some time (1 free night after 5 stays), but if you are a frequent business traveler (with a generous expense account), it can be done. The fastest way to earn free nights at this or any LHW hotel is to apply for an American Express credit card with Membership Rewards, especially one that is offering a limited time premium sign up bonus (I earned this stay from a American Express Gold Card with a limited time 75,000 membership rewards sign up bonus). The most popular personal Amex cards with Membership Rewards features are the American Express Premier Rewards Gold Card, and the American Express Platinum Card. You can also double these up with a business version of the cards such as the Business Gold Rewards Card or the Business Platinum Card.